Our bustling region has much for travelers to see and do, but we are also fortunate to have a softer, more serene side, marked by an abundance of outdoor activities. When it comes walking trails and hiking in PA, everyone from open-air enthusiasts to active amblers loves our proximity to nature. Local tradition holds that buffalo (also called bison) roamed this area, giving the Park its name. Today, Little Buffalo State Park in Newport hosts droves of roaming families looking for outdoor recreation, including hiking, picnicking, swimming, camping, fishing, hunting, boating, wildlife watching, and more. Little Buffalo has eight miles of hiking trails ranging from easy to difficult. Avid hikers will enjoy the 2.5-mile Middle Ridge Trail with short steep, climbs through a variety of habitats. The 1.5-mile Buffalo Ridge Trail takes you up Buffalo Ridge through mixed hardwood forest. Before it was timbered the area was covered in giant oaks, hickories, and American chestnut trees. The one-mile, easy treks include The Little Buffalo Creek Trail, featuring the sights and sounds of Holman Lake, Fisherman’s Trail, a mature hemlock forest whose thick canopy provides a cool walk even on the hottest of days, and the Exercise Trail, with 18 stations for pull ups, sit ups, a balance beam, and more. Families with strollers or wheelchairs can enjoy the quarter-mile Blue Ball Trail, adjacent to the East Picnic Area. Length: 8 miles, 8 trails, ranging from .25 to 2.5 miles. Pro Tip: Download the Pocket Ranger app to explore Pennsylvania’s state parks, use GPS maps, and more! Download for iOS and Android. Just north of the city of Harrisburg, this 1,025-acre conservation area offers a natural setting for passive recreation, like hiking, without an abundance of development and improvements to alter the landscape. Boyd Big Tree Preserve has an extensive 12-mile trail system ranging from easy to difficult hiking. Each of the trails connects to at least one other trail, so find a trek that suits your skill level! Start off easy with one of the loops that are good walks in themselves but also connect you to the more difficult parts of the forest. 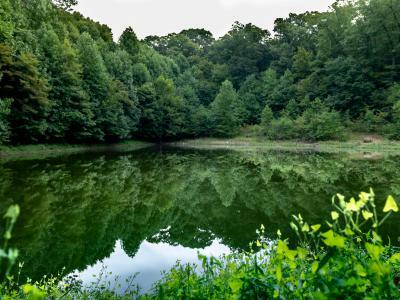 The 1.1-mile Lower Creek Trail takes you into the heart of the conservation area, while the 1.2-mile Pond Loop Trail offers a good chance to see some amphibians in the pond or encounter wildlife at this popular watering hole. Experienced hikers or anyone looking for a challenge will enjoy the 2.8-mile Janie Trail. It follows the ridge top with a steep climb down the mountainside. The 2-mile Upper Spring Trail gives you access to the largest trees in the conservation area. Visiting us in the winter? All of Boyd Big Tree Preserve’s trails are open for cross-country skiing. This 411-acre park is the largest of the Dauphin County-owned parks and was opened to the public in 2017. From meadows and streams to mature deciduous forests, there are a variety of ecosystems to explore. The park is largely primitive, but improvements such as picnic areas could be in its future. The trails at Detweiler Park are moderate, with both easy loops and difficult treks. The David’s Field Loop is a 1.6-mile moderate trail that provides a beautiful panoramic view and takes you around a pine area that’s home to forest wildlife, who are most active in the morning and evening. From the David’s trail, the Meade’s Mountain Loop is a 1.6-mile difficult hike with a steep slope climb that avid hikers will enjoy. Those looking for an easier walk can take the shortcut from Stackpole Trail to the Airstrip Loop, a 1.5-mile easy hike around a field. Did you know that the famous Appalachian Trail (AT) passes north of Harrisburg? Just a short drive from the city sights, you can trek a portion of the famous 2,190-mile route. We chatted with a member of the local trail club for some recommendations on where to hike! Avid hikers will enjoy the 3.1-mile Victoria Trail Loop, where you’ll follow the blue blazes for 0.6 miles, then the White Tail Trail for 0.8 miles to get onto the AT. Walk about 0.5 miles until you reach the double blue blazes and the sign for the Victoria Trail on the left. Follow this back to the parking lot for about 1.2 miles. There’s an elevation gain of 800 feet, making this a difficult hike. You can also try the longer, 5.7-mile Victoria Trail, an out and back version of the Loop. To get there from I-81, follow US Route 22/322 west to the PA Route 225 exit. Follow Route 225 for about 1.8 miles and turn right onto PA Route 325. Drive 4.9 miles to the first small parking lot on the left (Geocoordinates: 40.421599,-76.861687). The Hawk Rock hike is a 2.7-mile in/out journey with some rocky/steep terrain. The AT is on the road at this location. Follow the white blazes of the AT uphill on a rocky path for about 0.3 miles, where the AT path takes a short downhill to an old road. Continue walking on the AT about 1 mile uphill over sometimes steep and rocky terrain to the view at Hawk Rock, known for its gorgeous panorama of the Susquehanna River. This trail is wonderful for observing nature, bird watching, and taking Instagram-worthy snaps! This shorter 1.6-mile trail is great for dogs. To get there follow US Route 22/322 W across the Susquehanna River and take the first turn-off on the left immediately after crossing the river for PA Route 849. Follow Route 849 across the Juniata River and under the railroad bridge and bear left immediately after going under the railroad bridge onto Market Street in the town of Duncannon. Follow Market St. through town and under the US 11/15 highway overpass. Just after the overpass make a left onto Main Street. Continue straight on Main Street crossing Sherman Creek to the parking lot, which is located about 0.5 miles from the US 11/15 overpass (Geocoordinates: 40.381466,-77.029290). This loop hike is 5 miles in length with an elevation gain of 900 feet and some steep sections and rock scrambling. The AT begins at the ascent of Peters Mountain where you’ll follow the white blazes uphill for 0.5 miles. Pass the sign for the blue-blazed Susquehanna Trail, which is the return route for this hike. Stay on the AT, which is near level for the next 0.25 miles. The AT continues uphill using switchbacks and a narrow ridge-top path that requires some scrambling around and over rock formations about 2.0 miles to the blue-blazed junction with the Susquehanna Trail. Follow the Susquehanna Trail downhill on a sometimes steep and rocky path to the junction with the AT and return to the start. The Peters Mountain Ridge via the AT is shorter (4.2-miles) and more moderate. To get there, follow US Route 22/322 west to the PA 147 exit. The parking lot is at the end of the exit on the left (Geocoordinates: 40.395767,-77.00871). When it&apos;s time to kick off your hiking boots, grab a bite at the legendary Doyle Hotel in Duncannon. The Doyle serves as a welcoming stopover, offering good food, drink, and a place to rest for the Trail’s long haul thru-hikers. Be sure to wish them well on their journeys. Wildwood Park is a jewel for nature and wildlife lovers looking for a serene stroll. On a beautiful morning, you’ll see couples jogging, solo cyclists, families out for a walk, nature photographers, and lots of dogs getting their exercise! Wildwood has several paved, primitive, and boardwalk trails that encircle a peaceful lake, dotted with lily pads and water fowl. Your hike is what you make it, depending on what type of trail you’re into and how long you want to trek. If you want to walk the entire Park, hop on the Wildwood Way Trail (paved), then the Towpath Trail (stone), which will bring you back around again. The wooden North Boardwalk and Delta Boardwalk bring you closer to nature and include observation areas for spotting birds and wildlife. Be sure to stop by the Benjamin Olewine III Nature Center. It’s free to browse their interactive and educational exhibits about Pennsylvania wildlife and the importance of conserving our natural resources. Wildwood Park is just one of the many scenic stops along the Capital Area Greenbelt, a 20-mile urban pathway in Harrisburg. While the Greenbelt is most often traversed by cyclists, there are a few stretches that hikers and walkers can enjoy. Review the map and choose any section you like! 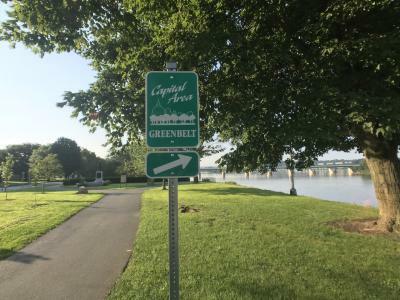 The Capital Area Greenbelt is made up of sections, each with their own personalities, sights, and sounds. The Greenbelt Parkways - Cameron Street and Paxtang – are perfect for day strolls, enjoying nature in an urban/suburban environment. The 1.4-mile (2.8 round trip) Paxtang Parkway is a walk in the woods without ever leaving the city. The trees provide a canopy on a hot day and the natural area attracts lots of wildlife. The parkway is paved and ADA accessible but also offers a few off-road trails for mountain biking. These trails take you a bit deeper into the wooded areas, adding to the oasis feel of the Greenbelt, then drop you right back into the Parkway. Parking is available at Derry Street, or limited parking at Market Street. Along the1.6-mile (3.2 round trip) Cameron Street Parkway section, you’ll find the Five Senses Garden, a tranquil place for visitors to enjoy the beauty of nature using sight, touch, sound, smell, and taste. The Garden represents one of the Parkway’s trailheads, so it can be your midway point on a roundtrip or your start/end point. Another hidden sight along this Parkway is the Rev. Dr. Martin Luther King Jr. Memorial at 19th and 28th, and only accessible via the Greenbelt. The memorial features an 11-foot black granite obelisk, the words of his “I Have a Dream” speech, and granite slabs along the pathway representing his 12 historic crusades. Trailheads and parking are available at Five Senses Garden, 19th street, or Cameron & Elliott Sts. This breezy 3.9-mile section of the Greenbelt offers scenic views of the Susquehanna River. You can start anywhere between Shipoke and the Jewish Community Center in North Harrisburg, but if you park on City Island you’ll ride across the Walnut Street bridge. Along the way, stop to enjoy the gardens, art sculptures, and memorials that give the city character! For this who are interested in taking on the entire Greenbelt by foot, set aside about 10 hours to trek its length! Situated in the middle of the Susquehanna River, City Island offers a one-mile flat loop for walking or jogging. Allow plenty of time because you’ll want to stop and see the stadiums, play miniature golf, grab an ice cream cone, hop on the train, and watch the Pride of the Susquehanna Riverboat paddle by. 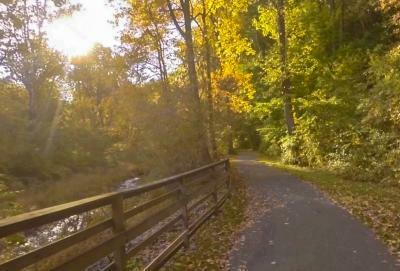 If you’re staying in Hershey, families will enjoy the three-mile Bullfrog Valley Park Trail, which follows a pond along Bullfrog Valley Road and ends at Shank Park and playground. 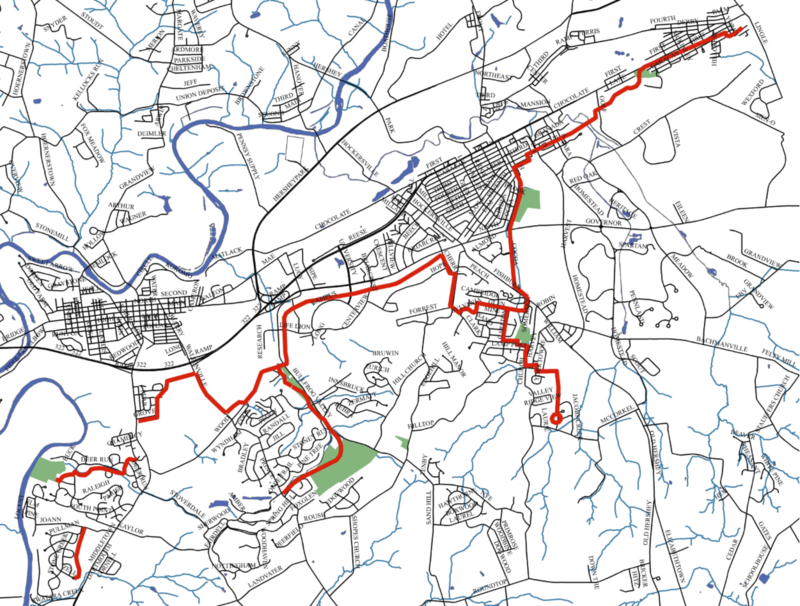 The Bullfrog Trail is a portion of the 13.5-mile Jonathan Eshenour Memorial Trail. This long route is a multi-purpose trail suitable for walking, jogging, biking, and pets. It traverses much of Derry Township, making it a great route to see the town. You can hop on anywhere, just check the map! Next time you visit the region, take a hike! Wait, don’t leave—we didn’t mean it like that!